This was yesterday's bento since Kidlet had no school today! Teacher in-service or some such event. All the neighbor kids were in my house as a result of the cold, coloring on the windows. If you've never seen Window Markers before they are amazing. Kids love to color and they love the feeling of doing something they normally are not allowed to do! It gave me lots of time to keep peeling apples for applesauce! 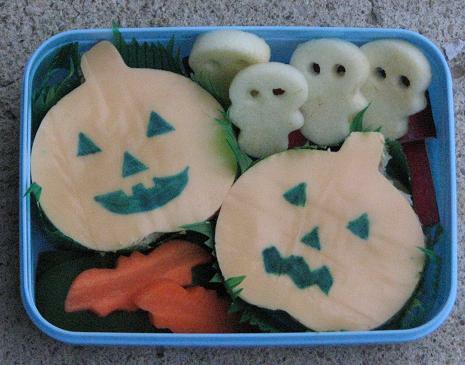 Kidlet's first Halloween bento of the season has two peanut butter and jelly pumpkins with cheese heads, carrot bats on top of green pepper, apple skulls on top of more apple slices. I'm really sad about the colors on this one because it person they were so lively! Sadly, it was raining and gloomy so I couldn't get a decent picture. oh this is too cute! I love the carrot bats.